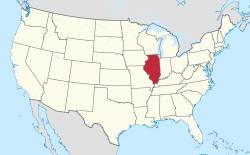 Collinsville is a city located mainly in Madison County, and partially in St. Clair County, both in Illinois. As of the 2010 census, the city had a population of 25,579, an increase from 24,707 in 2000. Collinsville is approximately 12 miles from St. Louis, Missouri and is considered part of that city's Metro-East area. It is the site of the Brooks Catsup Bottle Water Tower, the world's largest ketchup bottle, and is the world's horseradish capital. "Horseradish Capital of the World"
Location of Collinsville in Madison County, Illinois. Cahokia Mounds State Historic Site, a National Historic Landmark and UNESCO World Heritage Site, extends beyond the boundaries of the city toward the west. This prehistoric urban complex is estimated to have had a population of thousands at its peak, long before European exploration in the area. Monks Mound, the largest man-made earthwork in North America, is part of this complex. Collinsville is located at 38°40′28″N 89°59′43″W﻿ / ﻿38.67444°N 89.99528°W﻿ / 38.67444; -89.99528 (38.674398, -89.995402), approximately 12 miles due east of St Louis. The 90W longitude line passes through Collinsville. According to the 2010 census, Collinsville has a total area of 14.874 square miles (38.52 km2), of which 14.68 square miles (38.02 km2) (or 98.7%) is land and 0.194 square miles (0.50 km2) (or 1.3%) is water. As of the census of 2010, there were 25,579 people, 10,458 households, and 6,672 families residing in the city. The population density was 1,817.4 people per square mile (701.9/km²). There were 11,025 housing units at an average density of 811.0 per square mile (313.2/km²). The racial makeup of the city was 87.4% White, 11.2% African American, 0.8% Native American, 1.1% Asian, 0.1% Pacific Islander, and 1.7% from other races (according to the "race alone of in combination" section of the Census Summary File 1). There were 10,458 households out of which 29.3% had children under the age of 18 living with them, 48.1% were married couples living together, 11.9% had a female householder with no husband present, and 36.2% were non-families. 30.1% of all households were made up of individuals and 11.8% had someone living alone who was 65 years of age or older. The average household size was 2.35 and the average family size was 2.94. In the city, the age distribution of the population shows 23.2% under the age of 18, 9.7% from 18 to 24, 30.5% from 25 to 44, 21.9% from 45 to 64, and 14.6% who were 65 years of age or older. The median age was 37 years. For every 100 females, there were 93.3 males. For every 100 females age 18 and over, there were 88.3 males. The median income for a household in the city was $42,353, and the median income for a family was $54,956. Males had a median income of $39,379 versus $27,409 for females. The per capita income for the city was $22,048. About 5.6% of families and 7.2% of the population were below the poverty line, including 11.2% of those under age 18 and 6.6% of those age 65 or over. Collinsville is the self-proclaimed "Horseradish Capital of the World", and sponsors an annual Horseradish Festival. The area is said[who?] to produce 85% of the world's horseradish, of such high quality that Germany and China (key users of the herb) import it for gourmet use. The Horseradish Festival is held annually during the first weekend in June at Woodland Park located off Route 159 in Collinsville. It has activities for all ages, including a 5K run, live music, a beauty pageant, and root-grinding demonstrations. One of the most popular events is the Root Derby, sponsored by American Family Insurance, for which participants make a derby car from a horseradish root and race the "vehicles" during the festival. Known for its large ethnic Italian population, descendants of late 19th and early 20th-century immigrants, Collinsville hosts an annual Italian Fest in the fall. The Italian Fest has been held annually since 1983 and is located in uptown Collinsville on Main Street. This two-day festival celebrates everything Italian; it features live music and vendors selling authentic Italian food such as spedini, spumoni, bagna cauda, cannoli, and Italian Ices. Other activities include a parade, midnight bike ride, 5K Run/Walk, Little Miss & Mister Pageant, Bocce Ball Tournament, and a grape stomp. The Brooks Catsup Bottle Water Tower, a water tower in Collinsville. Collinsville is the site of the Brooks Catsup Bottle Water Tower, "the world's largest catsup bottle", a 170-foot-tall (52 m) water tower in the shape of a ketchup bottle, which is listed on the National Register of Historic Places. The bottle along with the property was put up for sale for $500,000.00 on July 12, 2014. In order to celebrate this roadside landmark, Collinsville hosts an annual World's Largest Catsup Bottle Festival in July. The Cahokia Mounds State Historic Site is located within the city limits of Collinsville. The largest Pre-Columbian settlement north of Mexico, it was developed by the Mississippian culture. This large park has been designated as a National Historic Landmark and was one of the first eight UNESCO World Heritage Sites designated within the United States; today there are a total of 23. At its peak about 1200 CE, Cahokia had a population of 20,000-30,000, more than any city in the present-day United States until after 1800. It includes Monks Mound, the largest prehistoric earthwork in the Americas, and more than 70 surviving smaller mounds. Monks Mound is larger at its base than the Great Pyramid of Giza. A museum and visitors' center provide a movie and displays which present the lives of the ancient inhabitants. During the French colonial era of its Illinois Country, a group of French Catholic monks had a settlement on Monks Mound, after whom it was later named. They cultivated agriculture on the terraces of the mound. They traded with bands of the historic Illini, who had migrated into the area after the peak of the Mississippian culture. Collinsville was originally settled by the Cook family and by a group of German-American settlers who arrived by Conestoga wagon in 1812 from Pennsylvania. They founded Holy Cross Lutheran Church. They also had a hardware store, though they were mainly farmers. Within five or six years, a number of other settlers arrived and began to organize the legal work required to form a town on the site. These original settlers are all buried in the Cook Cemetery or the Old Lutheran Cemetery. Other early settlers are buried in the Old German Cemetery near Sugarloaf Road near Maryville, Illinois. During World War I, a Collinsville mob, composed mostly of local coal miners, lynched a German immigrant, the only such wartime murder in the country. On April 5, 1918, the mob numbering up to 300 men took Robert Prager from his home and paraded him through the streets barefoot and wrapped in an American flag, forcing him to sing patriotic songs. Collinsville police interceded and took Prager into protective custody. The mob was later mistakenly allowed to search city hall, and two men found Prager hiding in the basement. They took Prager outside and the mob marched him to the outskirts of town, along the St. Louis Road, where they lynched him. His final request was to be buried in the American flag. Eleven men stood trial for the murder, but all were acquitted on June 1, 1918. Collinsville High School, whose teams are stylized as the Kahoks (named for a fictional Native American tribe), has won several Illinois State Championships, in 1961, 1965 (basketball), 1980 (baseball), 1981, 1986, 1991, 1992 (soccer), and 2007, 2008, 2009, 2011 (Dance Team). The Fairmount Park Racetrack for horse racing is located in Collinsville. The racetrack is owned by the corporation Ogden-Fairmount Incorporated. This is one of five race tracks in Illinois, and the only one located outside Chicago. Fairmont Park Racetrack features a one-mile oval dirt track and opened in 1925. The racetrack originally hosted both Thoroughbred flat racing and Standardbred harness racing. The racetrack has hosted popular races, including the Fairmont Derby in the 1920s and the St. Louis Derby in 2006, along with other weekly live races. Three restaurants are located at the track for visitors to enjoy: the Top of the Turf, the Black Stallion Room, and the 1st Turn Café. Admission for live racing is $1.50 per person on Tuesdays and $2.50 per person on Fridays and Saturdays. Several historical buildings survive in Collinsville. Built in 1885, the City Hall is still used today. It was built on property originally owned by the Collins family. The building features Italianate architecture with window crowns. A short, half-block walk from City Hall is the State Bank of Collinsville at the corner of Center and Main streets. Designed in 1916 by architect Robert G. Kirsch, this structure features limestone exterior and marble interior walls. Although no longer operated as a bank, the building still impresses visitors. To the west on Main Street, the Collinsville Public Library is a colonial-style brick building with an inviting circular stone walkway; the first section was completed in 1937. Additional wings were added in 1967 and 1980. ^ "World's Largest Catsup Bottle". Retrieved 6 November 2012. ^ a b "International Horseradish Festival". Retrieved 25 April 2015. ^ "Italian Fest – The Main Street Event". ^ "World's Largest Catsup Bottle Festival". ^ "Cahokia Mounds State Historic Site". ^ Stehman, Peter (2018). Patriotic Murder: A World War I Hate Crime for Uncle Sam. Lincoln, NE: Potomac Books. ISBN 9781612349848. ^ "Hunt Started for Lynchers of Enemy Alien", St. Louis Post-Dispatch, 5 April 1918; "Collinsville Mayor Let Mob into Jail, Thinking Prager Had Been Removed", St. Louis Post-Dispatch, 7 April 1918; "Coroner Says He Knows Five of Prager Lynchers", St. Louis Post-Dispatch, 6 April 1918; "11 Men Placed on Trial for Lynching of Paul Prager", St. Louis Post-Dispatch, 13 May 1918; "Plea of Prager Defendants to be He Was Spy", St. Louis Post-Dispatch, 16 May 1918; and "Jury Acquits Defendants in Prager Lynching", St. Louis Post-Dispatch, 2 June 1918. ^ Strebel, Neal. "Collinsville in Vintage Postcards". Collinsville Historical Museum. 2005. Wikivoyage has a travel guide for Collinsville (Illinois).